In Drucker on Marketing, William Cohen, a former student, has sifted through Drucker’s huge body of work, singled out his most salient ideas on marketing, and constructed them into a framework that not only outlines Drucker’s marketing philosophy but provides practical advice on how to achieve marketing goals in today’s business setting. For Drucker, profitability should not be the main focus of a business. The customer should be; the market should be. He didn’t consider marketing as one of many tools to generate profits. Rather, he viewed marketing as the driving force of business, a philosophy for defining and capturing the most enriching customer opportunities. I’ve chosen nine ideas that should convince you to read the entire book. This is not standard practice for book reviews, but in this case, every idea is worth reading – and more significantly – employing! Drucker wrote early on that because the purpose of business is to create a customer, the business enterprise has two basic functions: marketing and innovation. For Drucker, marketing and innovation produce results; all the rest are costs. Why is innovation so important? Because without innovation, you can’t convince a prospect to buy from you rather than a competitor. And how is innovation related to marketing? Because making a decision concerning what innovation to invest your time, money and effort in is part of marketing. Selling has to do with persuading a prospect to buy something you have. Marketing has to do with already having what prospects want. So having salespeople “bust their chops to sell a barely profitable product” is adversarial to marketing when a different profitable product could be sold in greater quantities with less effort. Drucker liked to say that “if marketing were done perfectly, selling would be unnecessary.” He took on the orthodoxy by recommending that sales and marketing activities should not necessarily be organizationally integrated. Drucker used the example of a sales manager being made marketing vice president. For Drucker, the skills, experience, education, and even the personalities of the two jobs are different. The salesperson influences the customer to buy what the organization has produced, while the marketer finds out what the customer wants and influences the organization to produce it. Drucker’s “marketing view” is based on four major instructions to executives: (1) market marketing to all internal organizations at all levels, (2) understand the difference between sales and marketing, (3) educate and lead, and (4) approach the business from the customer’s point of view. Drucker used to make the point that good leadership is essentially marketing. The first principle of leadership (and marketing) is to maintain absolute integrity. Without integrity, there is no way to succeed in the long term. There’s a section here that goes over eight principles of leadership that is worth the price of the book. What opportunities does the company want to pursue, and what risks is it willing and able to accept? What are the scope and structure of the organization’s strategy, including the right balance among such aspects as specialization, diversification, and integration? What are considered acceptable trade-offs for a company between time and money and between in-house execution and using a merger, acquisition, joint venture, or some external means to reach its objectives and attain its goals? What is the organizational structure appropriate to the company’s economic realities, the opportunities, and its performance expectations? Surprisingly, and I’m sure you’ll agree, most companies have not fully answered these four questions. Drucker’s secret is that you don’t predict success, you create it. If a new candidate is being stunted or neglected because an old, declining product (or service) is being maintained. Astoundingly, Drucker presents us with these 5 marketing sins (most of which are common practice): (1) seeking high profit margins and premium pricing, (2) charging what the market will bear, (3) using cost-driven pricing, (4) focusing on past winners, and (5) giving problems priority over opportunities. Clearly, Drucker’s view presages Clay Christensen’s principle of “disruptive innovation” by showing that seeking high profit and premium pricing inevitably leaves the door open for the competition. 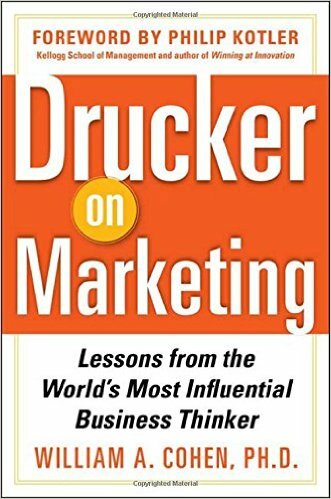 Drucker identified several ways of buying customers, none of them recommended by him despite their popularity in the marketing community. He was not talking about low pricing based on what the customer considers value, but rather low price a “bribe” to get the customer to buy. Drucker also made another important point: “bribes intended to buy customers attracted few, if any, new customers.” Marketers (and salespeople) would do well to learn this lesson. The book has many more examples of Drucker’s marketing insights, and is worth reading slowly. In an age of analytics and data, we must not forget strategy. Reading Bill Cohen’s Drucker on Marketing is a good first step.